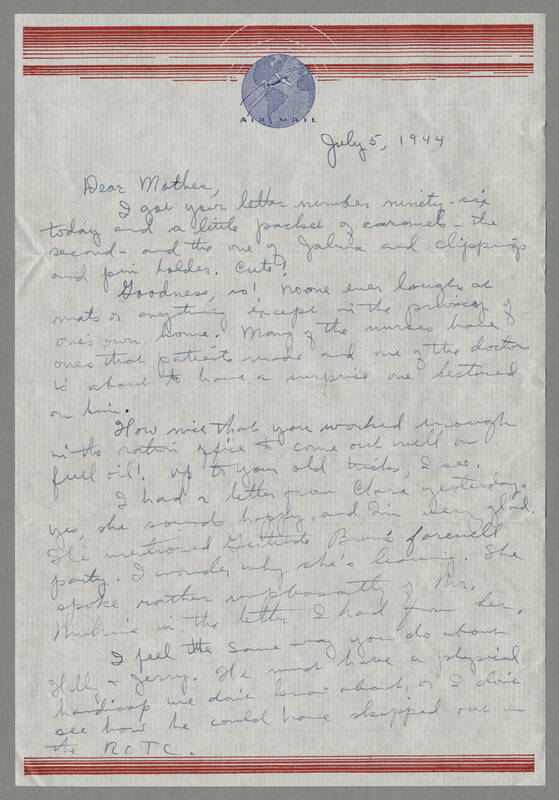 July 5, 1944 Dear Mother, I got your letter number ninety-six today and a little packet of caramels - the second - and the one of Jalma and clippings and pin holder. Cute! Goodness, no! No one ever laughs at mats or anything except in the privacy of one's own home. Many of the nurses have ones that patients made and one of the doctors is about to have a surprise one bestowed on him. How nice that you worked enough in the ration office to come out well on fuel oil! Up to your old tricks, I see. I had a letter from Clara yesterday. Yes, she should happy, and I'm very glad. She mentioned Gertrude (Brun's?) farewell party. I wonder why she's leaving. She spoke rather unpleasantly of Mr. (Mulrine?) in the letter I had from her. I feel the same way you do about Hilly & Jerry. He must have a physical handicap we don't know about, or I don't see how he could have skipped out on the ROTC.